In Vellum, something happened, but the enormity of the event can never be put into words. So instead the event is repeated and re-examined, over and over, from countless different angles. Every story is a separate story, not a continuing narrative, with separate characters. But every story is the same story, and the characters are always the same – in essence if not in flesh. It isn’t written linearly, because its story isn’t a linear story. It is a mosaic which you can only see small pieces of at a time, and once you’ve read the whole thing you have all the pieces and you can hold them in your mind and mentally take several large steps backwards and finally see the actual picture. Importantly, all the parts that make up the whole are themselves awesome. 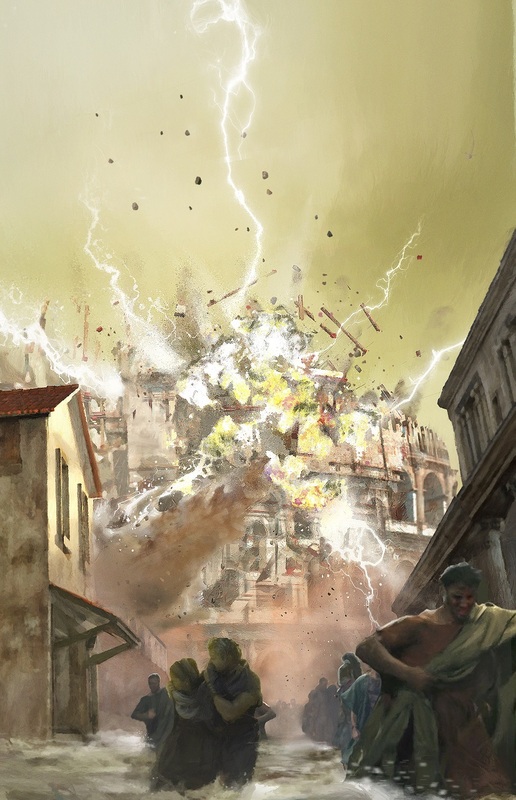 Like a mosaic, the various pieces may be different colors or shapes – there’s cyberpunk, there’s modern Lovecraftian horror (which is the best piece of modern Lovecraft I’ve read, but I am biased), there’s steampunk, there’s angels destroying each other in holy wars. But despite the differences, each piece is made of the same material as all the others, and the differences mainly serve to point this out. And the overall picture, the theme that all the different pieces keep circling around and coming back to, is extremely relevant to me. It’s a simple theme, and if the sparking event of the novel could be put into words, it would be a simple two-word story: people die. It’s hard to get people to read this. Most of the people I tried to get to read it didn’t get far, because they didn’t like it. But if you do give it a shot, and you like it, please let me know. It would be awesome to personally know someone else who’s also in love with Vellum. Hey, I just finished Vellum, on your recommendation. It has to be strangest book I’ve ever read, but very, very good. It was amazing how all of the different threads coalesced to create a whole picture. Although I got a different theme from the book, which is a little more pertinent to my current situation, I guess that’s typically how it goes. This will be a bit spoilery. I felt like most of the character’s identities were wrapped up in their relationships with the other characters, always playing out the same relationships and conforming to their archetypes, even though it typically ended badly. I felt this was echoed in the rag-and-bones-man sections. The village was built upon conformance to the societal rules, and each was defined by their relationships with each other. In the epilogue, Thomas rejects the judgement of the rag-and-bones-man, and with it refuses to allow his identity to be dependent on anyone else, even Jack. So, for me the book ended up being about how we ultimately need to find our own identity and path despite any societal expectations or attempts by others to define what we are. HOORAY!!! :D I’m very happy to hear someone else has read it! Oh, I like that interpretation of the end. I always had trouble with it, since it departs so much from the rest of it. That’s a damn good insight. Ha, Jack certainly was a badass. It seemed like I liked plot threads more than particular characters. I really liked reading about Guy’s journey through the Vellum. And the whole story with Jack and the city of the dead was great. Now that I think about it, Jack was the lead character in a lot of the plot lines I liked. 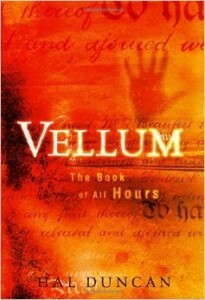 Finally read Vellum, it was my best read in months! The book had been languishing in my list for (checks date) two years now because House of Leaves wore me out for experimental story structure but last week I decided I was ready again. And then I couldn’t put it down. This book hits all the right spots. I love the non-linear, braided storytelling (am curious how differently it reads on a second pass) and the characters that (consciously) exist next to archetype in their portrayal. The integrated references to Sumerian and Greek mythology add a whole layer of fun of their own. The scenic furniture of the book (mytho-cyberpunk! Lovecraft-Indiana Jones pastiche!) 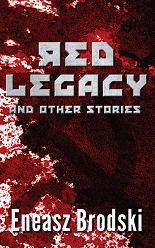 varies from chapter to chapter in a way that’s fresh and hits many of my favorites. Usually you have to delve into micro-fiction to get that. Thanks for the recommendation, A+ would read again. Yesssss!! I’m very happy you liked it! :) Partly because I’m glad I didn’t waste your time, but also because I hope some day this gets the recognition it really deserves. If it doesn’t get it before the generation that lived through both 9/11 and the Matthew Shepard murder passes from relevance than it never will, because I kinda feel like those a key touchstones.